The start date of 3/15 draws closer and closer. As well, today, 2/28/2017, is Rare Disease Day of 2017. MPNs qualify as rare diseases. A couple things: you can see, in the first "dressed" pic, that the blade is suddenly black. This is the miracle of Cerakoting; likewise, in the final pic above, you can see the red spine - again, Cerakoting. In the above pic, we show off the newly Cerakoted standoffs. 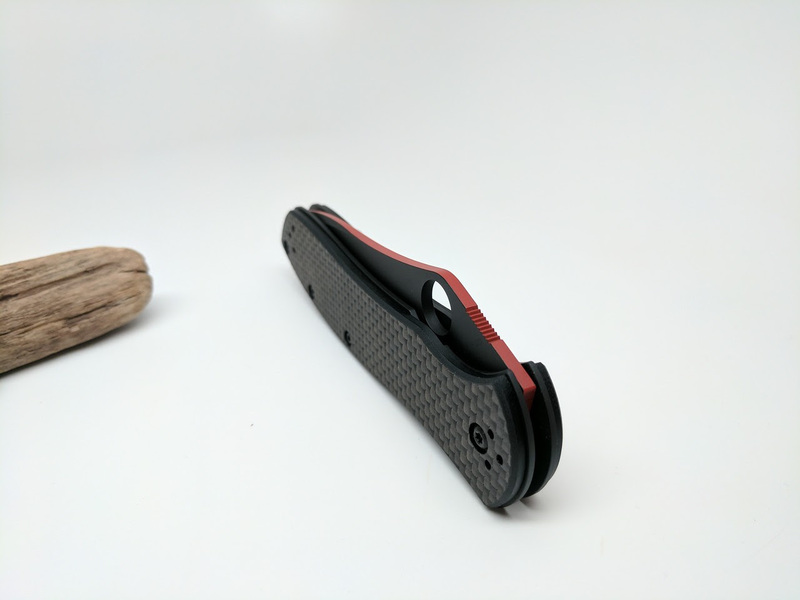 The Cerakoted blade buys a couple things: since the GB blade is made from a tool steel (CPM M4), and not a stainless steel, it will corrode. However, other aspects of its performance (hardness, toughness) are exemplary. The Cerakote process will eliminate the weakness - susceptibility to corrosion. There are other ways to eliminate this predeliction: however, Cerakoting means that it is done once, and never revisited. This is a good thing - the less the user has to maintain, the better. Cerakoting means that the corrosion factor is a thing of the past - now you can just enjoy your knife. 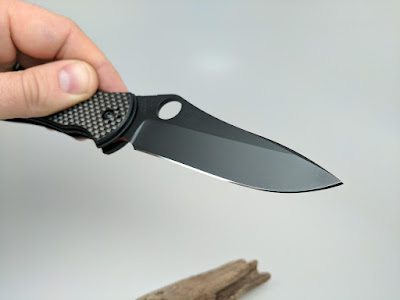 The Cerakoting was performed by Josh of Razor Edge Knives. To learn a little more about Cerakoting as Josh sees it, please visit his page. 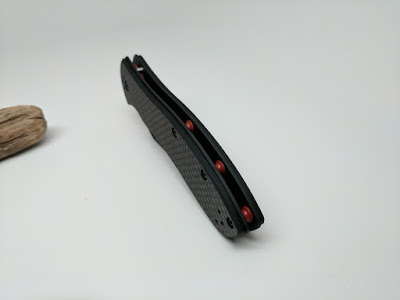 A couple other things to notice about the knife: most obviously, I think, is that we decided to Cerakote the stand-offs and the spine in a different color than the blade faces; the color is one of the official colors of myelofibrosis. What you may not have noticed, but is pictured to some degree in the the second picture: the edge honed by Josh is a mirror-finish edge. 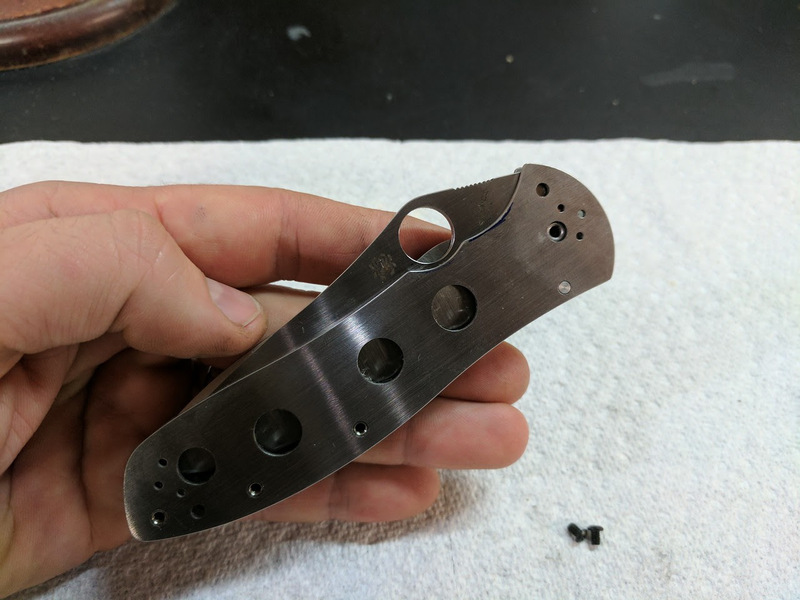 All in all, I'm very pleased with the result of Josh's work, and am looking forward very much to seeing the completed knife. As it sits, we took a Spyderco knife that is hugely popular, customized it to have the colors we wanted, and eliminated the big weakness of the M4 steel. i think I'm going to save my pennies and have another one of these built just for myself!